Today is Memorial Day, a day to remember those who died serving our country in the military. I looked through my photo collection, trying to find a nice photo of Arlington National Cemetery to post for Memorial Day. Alas, nothing I found was of posting quality. 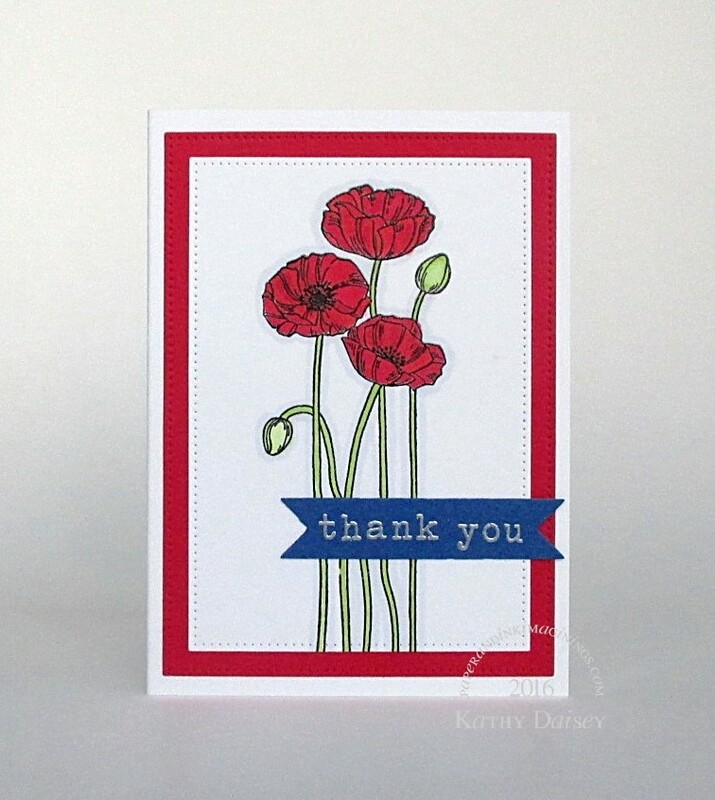 Knowing that the red poppy symbolizes Remembrance, I thought a thank you card with red poppies would work for Memorial Day. Supplies: Stamps – Hero Arts, Stampin’ Up!, paper – Neenah Classic Crest Solar White, Stampin’ Up! Brilliant Blue (retired), Real Red, inks – Copic 100, C1, R02, R24, R29, YG0000, YG03, Yg25, VersaFine Onyx Black, dies – My Favorite Things (pierced rectangles), Stampin’ Up! (banner), embossing powders – Filigree Fine Art Powder clear, Ranger Silver Pearl. Categories: card, thanks | Tags: card, Copics, Hero Arts, My Favorite Things, Neenah, Ranger, Stampin' Up!, Tsukineko, VersaFine | Permalink. It does work indeed. Lovely card and a totally appropriate sentiment to accompany it. Oh, Mike, that is so sweet! I appreciate your offer! I know I have more photos from Arlington here in my house…but I only found a pack from 1988. I must put on my thinking cap and figure out “how old were the kiddos when we took them?” so I can figure out which photo box or file folder to start my search.